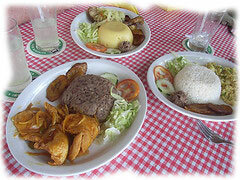 Dominican Republic food is a mix of Spanish influences and those of the native Taino Indians. Columbus claimed and subsequently exploited the island on his first voyage in 1492. Many of those Spanish traits are still present and you will definitely notice a Latin American feel to the island and its cuisine. Seeing the way Spanish dishes like Paella have become truly Dominican dishes is interesting. They are still essentially Spanish, but ingredients and flavors have changed to reflect fresh ingredients available in the average Dominican household. Their cuisine is not as spicy as you may expect after visiting other islands in the West Indies. The main spices used in Dominican recipes are onions, garlic, coriander and oregano. In fact, much of the livestock on the island graze on wild oregano which gives Dominican dishes a kind of pre-marinated flavor. What Dominicans tend to eat depends highly on where they live, near the Sea or in the mountains. Regardless, most Dominican meat dishes tend to involve goat meat as the animals are farmed quite heavily on the island. The Dominican Republic does have excellent cattle, but they tend to export the bulk of their prime beef stock. Keep in mind that meat dishes tend to be very well cooked or even stewed in Dominican restaurants, a tradition stemming from lesser availability of refrigeration on the island. Seaside Dominican fishing villages will have great varieties of seafood; the most common being shrimp, marlin, mahi-mahi, lobster and Dorado. Most villagers will more commonly dine on cheap lesser quality fish usually stewed with la criolla (rice). Premium seafood tends to be too expensive for the locals and is saved for the island’s main industry, the tourist resorts. If you do have a chance to go to a restaurant in one of the fishing villages along the coast, resist the temptation to order the lobster. Instead try one of the stewed fish dishes. You’ll notice the very rich blending of flavors that Dominican mothers have been perfecting for hundreds of years. You can get great lobster anywhere, try a traditional Dominican dish; you won’t be disappointed. Visitors to the upscale resorts in Punta Cana will see all styles of Dominican dishes mixed with dishes to appease primarily North American palettes. Most resorts have one “a la carte” restaurant that focuses on local cuisine. When ordering at these restaurants, try asking your waiter what they suggest and what they believe to be the most authentic Dominican dish. Many tourists love to visit different countries and cultures, but still want to eat the same things they do at home. If you’re this type of tourist, keep in mind that a hamburger or a steak in Punta Cana will NOT taste the same as it does at home. You’re visiting a different and beautiful culture, keep an open mind (and mouth) try something new.